It can be hard to ask for what you want when you know it probably won’t be covered. This can leave some folks feeling they’ve been overcharged for metal-free, biocompatible alternatives. But that hinges on you being unaware of some things your insurance company probably doesn’t want you to know. For one, they don’t care that composite restorations are technique sensitive. 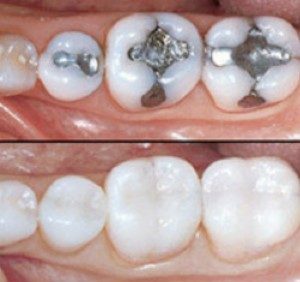 Unlike mercury amalgam, tooth-colored composite must bond to the tooth. Otherwise, they won’t hold up over time. So there are three basic steps in creating a white filling: etch, prime, and bond. Each layer of the composite must be light-cured into its hardened state. All of this takes time. In contrast, mercury is not particularly technique sensitive. Though mercury can be bonded, many dentists forgo this step. Mercury can be packed into the tooth without layering or creating a dry field. And since it can literally be placed underwater, a dentist who uses mercury can do these fillings much more quickly, fitting more patients and procedures into each work day. More production, more money for the dentist. Finally, insurance companies falsely believe that composite is only a cosmetic choice – one that won’t hold up on heavy use teeth like molars. That may be the case if a dentist places the materially as carelessly as amalgam. If proper bonding technique isn’t used, of course the composites will fail. But done properly, most composite fillings should last just as long as the average mercury one. Learn more about the role insurance companies play in maintaining the dental status quo.